Hours: Mon-Fri: 11:30 a.m. – 2:00 p.m.; Wed-Sat: 5:30 – 10:00 p.m. The multicultural metropolis of Montreal is a melting pot of diverse ethnic communities, and the colourful gastronomic scene in this cosmopolitan city continues to pique my curiosity. Without having to leave the locale, I am able to seek ambrosial adventures and pursue palatable pleasures, revelling cuisines of different countries and regions, from Syrian and Swiss to Turkish and Thai. The culinary kaleidoscope driven by the creative force of chefs continue to stimulate my senses and pamper and sometimes provoke my palate. The rich and intricate gastronomic landscape of Latin America have always intrigued and captivated me, in particular, that of Peru, which is the third largest nation of South America. Recently recognized as the “Cultural Heritage of the Americas” by the Organization of American States (OAS), Peruvian cuisine has been influenced by the Mochica and Inca civilizations and later by Spanish, Basque, African, Sino-Cantonese, Japanese, and finally Italian, French, and British immigration. It represents an embroidered synthesis of culinary customs and techniques and unique flavours and ingredients of four continents, resulting in an eclectic yet harmonious pan-hemispheric style of cookery which continues to evolve, its culinary complexity flourishing from originality, quality, and variety. The epitome of fusion before fusion became über-cool, Peruvian cuisine exudes an exotic and piquant appeal, and it continues to gain a growing foothold on the world stage of gastronomy. Since the beginning of the new millennium, a very small number of alluring bastions of cocina peruana have blossomed in Montreal. There is the gallery-like outpost Mochica, helmed by Peruvian-born chef Martin Oré, in the heart of the Plateau Mont Royal hub, which I have frequented several times, and the casual covert SolyMar, headed by chef M. Luis Corcuera, located in the Villeray-St-Michel borough. But in the nearby neighbourhoods, there also lies the trio of sleek restaurants owned by Lima-native chef Mario Navarrete Jr., the intimate hideouts Madre sur Masson in Rosemont-Petite-Patrie and Madre sur Fleury in Ahuntsic and the former Raza, which has recently been transformed into the contemporary cantina Callao. But another gastronomic gem awaits the adventurous foodie traveler nestled away in the Gay Village district, and this one is the brainchild of the extraordinarily talented chef Marcel Olivier Larrea, who hails from the “Ciudad de los Reyes” (City of the Kings) in Peru. Already at an early age, chef Larrea showed a natural inclination towards for cookery; he learned as much as he could from his mother and family cook in the house, educating his palate and mind with Lima’s culinary culture. After honing his skills at Le Cordon Bleu del Perú, he landed stints at various establishments in Peru and Canada, including the prestigious temple of haute Andean fusion gastronomy Astrid y Gastón of renowned ambassador and “king of Peruvian cuisine” Gastón Acurio in the capital of Peru. Then in 2012, Larrea decided to set up his very own upscale eatery Mezcla in Montreal and two years ago, he opened Sandouchon, a Quebecois-skewed Peruvian gourmet sandwich place situated in Les Cours de Mont Royal. These ventures further allow him to share his innovation, expertise, and passion for cooking. At the fittingly named bistro-like mecca Mezcla, chef Larrea, like his fellow Peruvian culinarians, boasts nuevo latino cuisine with an emphasis on fresh, quality ingredients, many of which are sourced locally. A herb garden arranged around the open kitchen has been provided by his Venezuelan partner Geraldo Labarca, while the well-curated collection of wines includes privately imported bottles from Spain and a lineup of Latin American countries. Combined with his knack in, and knowledge of, a variety of cooking techniques, sharp sense of flavours and seasoning, intuitive understanding of flavour pairings and affinities, imaginative and intuitive mind, meticulous attention to detail and composition and colour, tastemaster Larrea confidently creates and executes concoctions, showcasing a European- and Asian-influenced South American cuisine that is reworked reverently and thoughtfully in a modern context. Upon my very first visit to this stylish 50-seat resto, I was captivated and fascinated by the eclectic and edgy mélange of world flavours and global influences, a creative collision between familiar and foreign, traditional and innovative. Presented on a medley of fine porcelain, slate and wood tableware, classic and imaginative dishes romance the palate and rejuvenate the diner’s senses. I relished savoury offerings like the longstanding specialty pulpo al olivo—slices of slow-cooked octopus tentacles smothered in an intense, briny emulsion of puréed Botija black olives and XO olive oil and accessorized with spicy shichimi togarashi, crunchy maiz tostado, and fragrant micro coriander; and a French-oriented reinterpretation of the Nikkei delicacy tiradito de atún—flat rings of raw red tuna encircling handsome rounds of foie gras au torchon, the exquisite ensemble seasoned with a spicy sauce, Spanish olive oil, and pink salt and trimmed with enoki mushroom tempura, toasted maiz chulpe, caper berry rings, and fresh Chinese parsley; and dessert standbys such as the French-inspired fondant au chocolat, a deep, dark, melt-in-the-middle moelleux accompanied with a quenelle of vanilla ice cream striped with wild blueberry coulis and surrounded with a gravel of coarse almond crumble, and the iconic Quebecois classic, an unpretentious yet patrician pouding chômeur sweetened with maple syrup and lavished with a dollop of vanilla ice cream. Seductive and scintillating, the seemingly simple yet fine fare was a study of fusion cooking, and I instantaneously succumbed to the hedonistic pleasures of sunny and sophisticated comida sudamericana. When Mezcla decided to offer a special epicurean event as part of its Soirée dégustation series, a nine-course tasting menu highlighting the cuisines of Peru and Portugal and featuring guest chef Rodney Pimentel, former owner of Le Billot, my bon vivant friend, who has roots in the latter country, and I quickly jumped at the unique occasion. So we returned to the hip and trendy haven, a high-ceilinged and open-concept milieu accentuated with a subdued scheme of brown tones and wood panels and furnished with grey lantern lights, wooden chandeliers, and timber tables with their complementing chairs in various configurations. South American paintings decked the brick and partially wood-lined walls, while a large blackboard listing menu items graced the brick wall behind the open kitchen where chef Larrea was conjuring up enticing comestibles. As we soaked up the infectious conviviality and laid-back exuberance, we waited with curiosity and in anticipation for what was to be unveiled that evening. In fervent fashion, the gastronomic ritual commenced with a deep-fried amuse-bouche. Made with a minced blend of poached halibut and octopus, the spherical seafood croquette, crisp and golden brown, was poised atop a shallow puddle of housemade tartare sauce enhanced with ají amarillo paste and embellished with chopped capers, brunoised onion, and minced parsley. A sprinkle of paprika provided a hint of heat that was whole-heartedly welcome, especially for my friend, who was suffering from a mild sinus congestion. As a palate-pleasing prelude to the multi-course meal, the breaded ball of indulgent goodness set the benchmark high, and the song of praise did not stop here. The first course ensued, and the dainty dish represented one of Peru’s signature seafood staples which has been punctuated with Japanese influence: the ceviche. 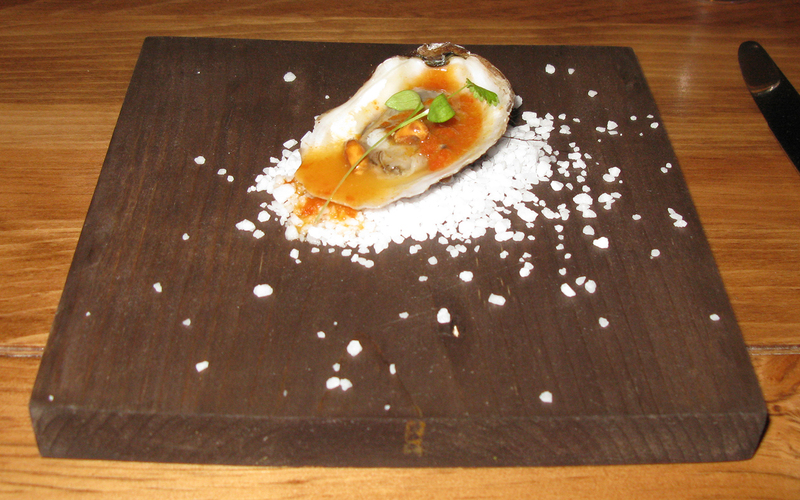 There are numerous variations on this timeless mainstay, and that evening, chef Larrea displayed the cured fresh oyster on a half shell over a loose bed of sea salt. Doused with an orange-hued leche de tigre heightened with ají panca paste and crested with toasted chulpe and a sprig of house-grown micro cilantro, the mise en bouche was delightfully light and refreshing. Next was a taste of Iberia, and invited chef Pimentel gave a titillating twist to the quintessential kale soup, a deep and luxurious iteration which straddled between the Minhotan caldo verde and its country cousin the Azorean sopa de couve. In his take on the time-honoured treasure, the Portuguese green soup, composed of lamb stock, was filled with the requisite ingredients, thin shreds of baby kale and little cubes of peeled potatoes. To complete the steamy bowl of comfort food, small smoky chouriço pieces, dark red kidney beans, and a soft-boiled quail egg were added to the assorted amalgam, elevating this homey, humble mainstay to hearty, extravagant fare. For the third course of the evening, chef Larrea concocted yet another crowd-pleasing croqueta de marisco. Anchored atop a liberal smear of ají amarillo reduction supplemented with onion, garlic paste, and a dash of nanairo togarashi, the perennial Peruvian papa rellena was ornamented with fresh house-grown dhania sprigs. Here, the croquette was made with mashed yuca root instead of the usual white potato and was stuffed with a saporous mixture of baby shrimp and garlic sprouts. Complemented with the relatively spicy chile sauce, the deep-fried tuber croquette, with its crisp exterior, was a toothsome treat. Absolutamente sabroso. At this point of the repast, my friend’s sinuses were completely cleared due to the presence of peppery spices in the various delectables. 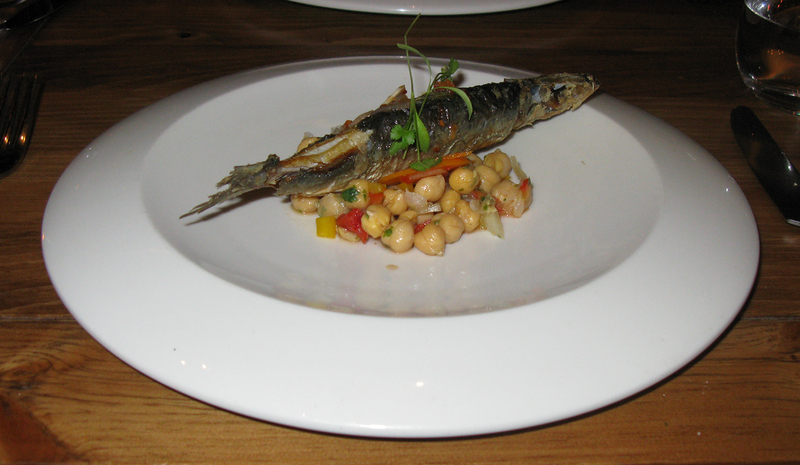 If there is one type of food that is synonymous with Portuguese cuisine, it is the sardine, and that night was no exception. In chef Pimentel’s riff on the flagship dish sardinha assada, the poisson gras, presented in its entirety, was pan-seared and then fried. Arranged beneath the crisp-skinned fish, rounds of pickled carrots were assembled above a bed of chickpea escabeche jumbled with diced red and yellow peppers and white and red onion and finely chopped fresh coriander. It takes skill to debone the sardine, but following the sound advice of one of the wait staff, we were able to succeed with relative ease as we removed the sweet, flaky flesh from the formidable bone structure and feasted on the lean, moist meat along with the gratifying mix of legume and vegetables. Splendid. 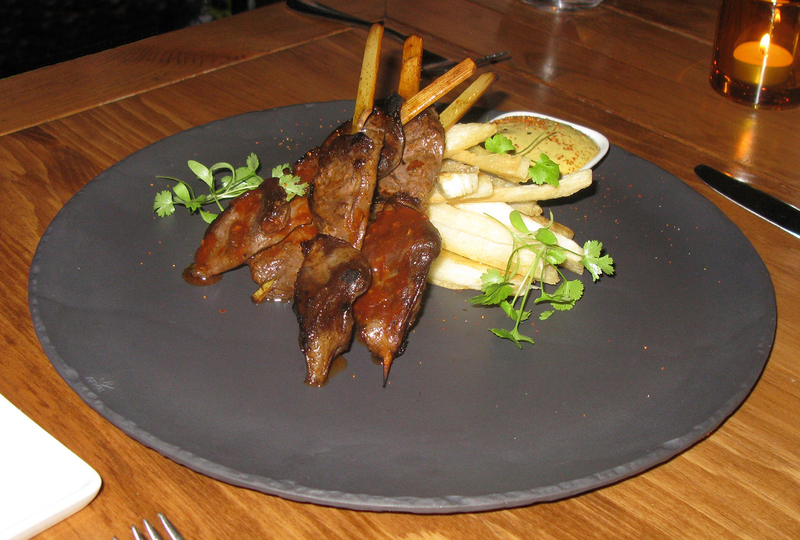 Continuing the alternation between Peruvian and Portuguese selections, the fifth course focused on another Latin American number; this time it was the ubiquitous anticucho peruano. 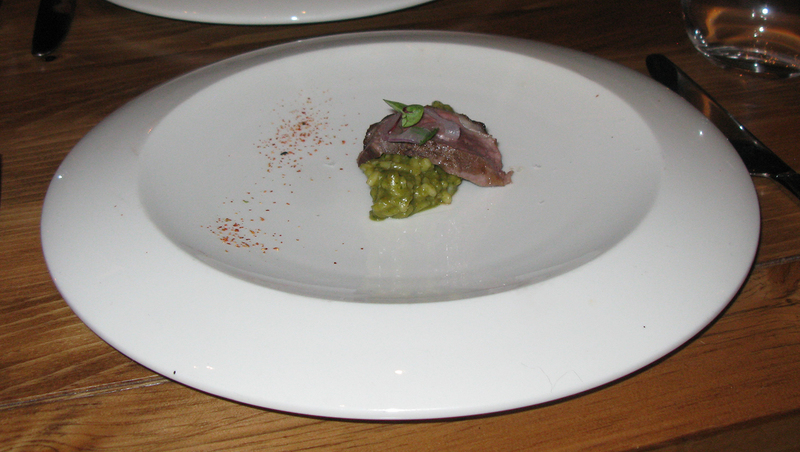 In chef Larrea’s rendition of this comida callejera, Lac brome duck hearts in lieu of beef ones were featured. Cradled on top of pairs of glorious, grease-free cassava fries, the skewered anticucho de corazón de pato, marinated in cumin, red vinegar, and ají panca, were impeccably seared in a cast iron skillet. Crowned with a fresh sprig of Chinese parsley, the two offal pieces, meaty and tender, were dressed with a dollop of salsa a la huancaína intensified with ají amarillo paste, cumin, ají panca, and other spices. My friend, who had sampled this delicacy with me during our earlier visit to Mezcla, again reached a state of euphoria. Totally scrumptious. For the ensuing course, chef Pimentel delivered a swoon-worthy assiette which starred not the common skate wing but the whiting fish. 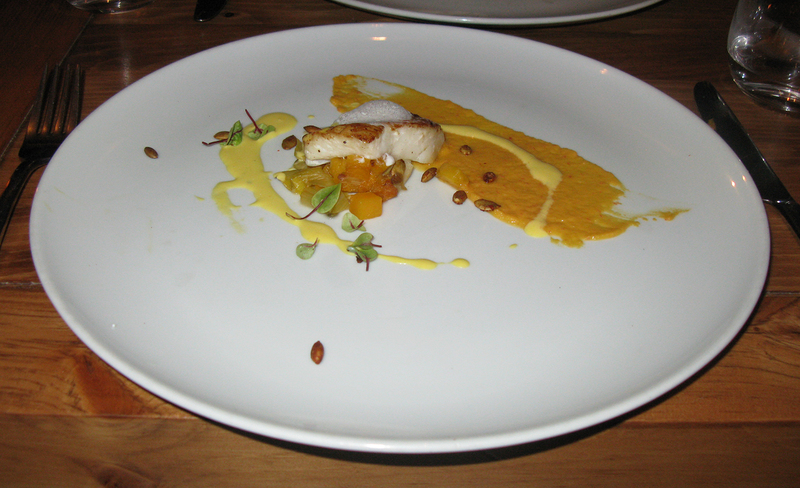 Simultaneously pan-seared and steamed, the firm yet delicate filet de merlan, adorned with ethereal saffron foam, was plated with butternut squash prepared two ways. Juxtaposed beneath the browned fresh catch of the day, soft cubes of the bell-shaped gourd teamed up with supple strips of mellow leek, while a thick swath of winter squash purée overlaid with a swirl of saffron reduction framed the centrepiece of the soigné composition. To complete the seafood standout, the luscious creation was jazzed up with spinach dock and pumpkin seeds which were boiled, spiced, and toasted. An elegant étude of well-balanced flavours and textures, this playful plat de résistance tasted as good as it looked on the white, round canvas. Sublime. It was then again chef Larrea’s turn, and for the seventh course, he revisited another trademark specialty from his homeland. In his version of the arroz con pato, the legendary war horse from the city of Chiclayo in northwestern Peru, the Spanish Criollo delight was given a global spin. Regular rice was replaced with arborio rice, lending a Northern Italian accent to the dish. Cooked in herbs, puréed cilantro leaves, and black beer instead of the traditional chica de jora, the green-stained cereal grain imparted a fragrant flavour. The succulent slice of duck magret which cushioned atop the modicum of arroz verde equally shared the spotlight. Garnished with onion rings and fresh sorrel, the tender duck breast was given a spicy kick as it was marinated with ají panca, vinegar, and again black beer. Save for a pronounced hit of sea salt in one forkful of rice, the robust entrée, finished with a gentle dusting of shichimi togarashi, was sapid and sumptuous. As the penultimate course, we were treated to the famous proverbial Portuguese surf and turf masterpiece, the carne de porco à Alentejana. Marinated in red wine vinegar and a bevy of Mediterranean spices, the pink-centered lobe of Gaspor pork loin, perfectly poêléd, shared the bowl-plate with lovingly braised, briny clams surrounded with some of their half shells and toothsome oven-roasted potato cubes encased with dark golden brown crusts. 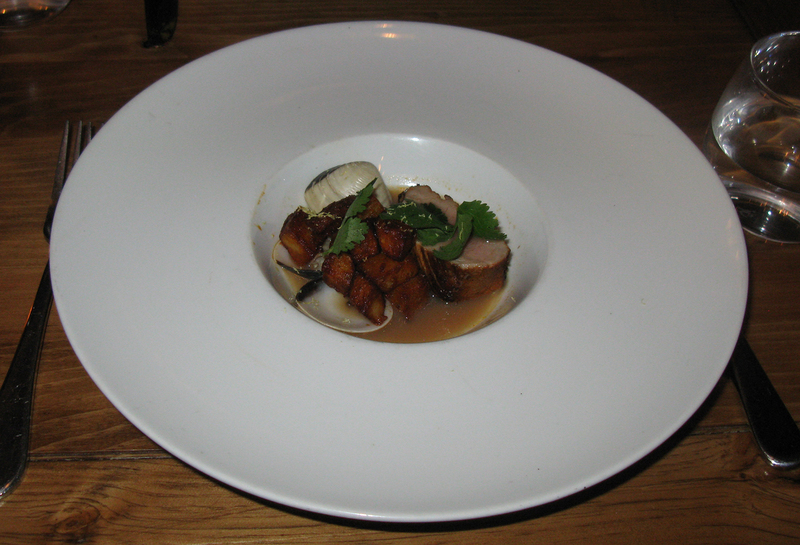 These three compelling, cohesive components in this petit plat principal were ensconced in a pork and clam jus spiked with red pepper flakes, which, similar to most of the victuals of the night, unleashed a pungent hint of chili heat. Decorated with fresh dhania leaves, the stellar showpiece was pitch-perfect. To culminate the remarkable regale, the sweet course comprised of only five fundamental parts, which included the presence of one of the highly regarded ingredients of Portuguese cuisine: the heaven-sent egg. Pared-down yet playful, the deconstructed dessert, displayed on the black slate plate, was naturalistic and rugged in presentation, almost New Nordic-like in aesthetic. Interspersed with traces of crème anglaise, a pillowy cloud of a crème brûlée and meringue mash-up was placed adjacent between an irregular scoop of passion fruit gelatin and a loose pile of tea biscuit “sand.” Scattered with a coarse sprinkling of “soil” composed of crushed Oreo wafers, the elemental yet cerebral aggregate served as a playground for the palate, a palette of sweet, tart, velvety, and granular, a whimsical way to conclude the dreamy dinner. Throughout the evening, service flowed at a leisurely pace. The courteous and friendly wait staff who worked the floor took care of the visiting patrons; they uncorked bottles, presented each dish to the seated diners, cleared individual plates and replaced cutlery between courses, refilled water glasses, and made sure, in an unintrusive manner, that the food was to their liking. Again it was yet another enthralling and exhilarating experience, and my friend and I were still mesmerized about the fabulous fare when we had left the popular hotspot. It was another formidable moment that remains etched in my mind. But alas, I learned during my most recent visit to this urban destination that chef Larrea no longer works at Mezcla. Along with David Dumay, the co-owner of Sandouchon, and David Schmidt, the restaurateur prodige and owner of Maïs, Datcha, and Le Mal Nécessaire, he has been busy with another project, the brasserie-style restaurant Tiradito, which offers Nikkei cuisine, the fusion of Japanese and Peruvian specialties; the new venture was just launched a week and a half ago. Since his departure, a young and modest culinarian by the name of Katrina Tomczak of Polish-Ukrainian descent has recently taken over the stoves and stepped up to the plate. Since her recent appointment as chef de cuisine at this modish hideaway, little has changed on the menu. She shows progress, potential, and promise as she has attempted to replicate faithfully chef Larrea’s original dishes (in some instances, with a few minor modifications) and has slowly taken action to overcome various shortcomings, correct flawed executions, and tweak and refine details in the adopted concoctions. It’s not an easy act to follow in his footsteps, especially when the bar has been raised so high, but she has managed to pull it off with perseverance, dignity, grace, and integrity. The celebration of food is the cornerstone of pleasure, culture, and community so let’s continue to contemplate and celebrate the beauty of food and engage in the pleasure of sharing and savouring the enriching experience. This entry was posted on Tuesday, October 25th, 2016 at 11:01 pm	and is filed under Art, Food/Wine. You can follow any responses to this entry through the RSS 2.0 feed. You can leave a response, or trackback from your own site.